If he was eligible last year he probably would have been a first round type of talent after leading Miami in homers with 21. This year, he hit just three and didn’t even reach double digits in doubles. Could it have been the bats? Possibly. You really have to square it up now to make the ball go. It doesn’t make sense when you watch his swing and that everything about his load step, balance, and weight transition is very good. This was a guy that competed in the Cape Cod League home run derby in 2009 and has some pop in his bat. The one area of concern is that he hasn’t mastered squaring the ball up perfectly yet because his bat doesn’t stay in the hitting zone quite long enough, and it almost looks like he’s trying to make his swing too perfect, which could be why he gets stiff at times with his arms. The stiffness in the arms might give up problems with top velocity. When he does square the ball up and get those arms extended, it jumps off his bat. Bat speed isn’t an issue. The power is still in there, and he has a great looking, extremely athletic 6-3 frame that is very athletic/muscular. 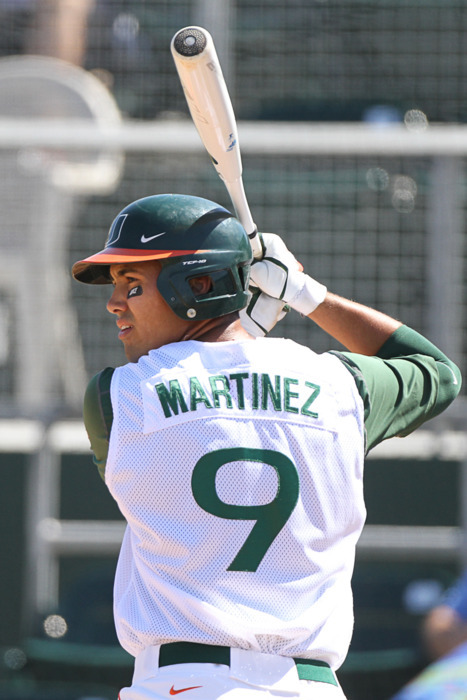 A professional hitting coach could make a huge difference for Martinez. This is a very good value in the third round, plus his 2009 Cape Cod League manager raves about him. Summary: Martinez is a good athlete and a good defender at 3B, and a 55 for his fielding/arm might be underselling him slightly. He also has above average raw power and isn’t a base clogger, though he also won’t be a base stealing threat. Martinez’s biggest problem is consistency. He was a first round talent out of high school and showed flashes of brilliance at Miami, but he hasn’t been able to put things together. If everything works out as expected, he should be an average regular, but if he develops more consistency and makes more contact, he might be more than that. Hooray for a profile. But is “Speed: 50/45” a typo? He’s an average runner now, and he’s probably going to slow down in the next few seasons because hes a big dude. Ok, thanks. I was confused by that.